Today our blog features an interview with Jordan Forth, our BUFF BRIDE’s Personal Trainer. Christen, our Buff Bride has been working with Jordan since March and getting into the best shape of her life for her Fall ’12 wedding. Christen has been consistently working out in our fitness center with Jordan for Strength training workouts, combining this with Evening Yoga classes and gym workouts on her own. The Y: Hi Jordan, thanks so much for meeting with us today. To start, we’d like to know how have the workouts have affected her progress? Jordan: People when they work out, or in life, tend to play to their strengths. As a trainer, I’m someone who motivates her through the things she doesn’t like as much. Consistency with a trainer especially, always affects the progress, as opposed to her working out on her own. When you’re with a trainer, you don’t have to think about what you’re doing, someone else does that for you. And you also have someone who can motivate you, which has a huge impact on progress. In fact, I always tell people to work out with a partner or with a team, because it keeps you accountable to someone. The Y: And takes them to the next level? Jordan: Exactly! It’s very motivating. Even me, I’ve been working out since I was about 12 years old. And if I’m working out with someone else, or a team, I’m always going to push it that much more, not only for myself but for the people who I’m with. As far as a trainer is concerned, people will push it that much more because they have someone to do it for. The Y: Christen’s workouts went for the mix of the strength and endurance workouts combined with Yoga. How have they complimented one another and affected her progress? Jordan: Yoga is great. I do it and have done it for 13 years. Flexibility is essential, along with strength, cardio and endurance, those are the keys to fitness. With most people there are specific things where they need flexibility. In general, one has to be careful about hyper flexibility, and putting joints at risk by creating hyper flexibility where you don’t need it. As I mentioned, People work towards their strengths. Christen has done really well balancing the flexibility training from Yoga with the Strength and muscular endurance training with me. Christen has also been working around her busy schedule. She’s got a great career, she travels a lot, and she works out when she can and what works with her life. She needs to reduce stress as much as she needs to build strength, and the yoga and cardio training she’s done outside of the workouts with me have been great for her. One other thing about Yoga is that it also balances your nervous system, you connect with breathing, focus on body awareness, body mind connection. Yoga and Strength complement each other tremendously for that. 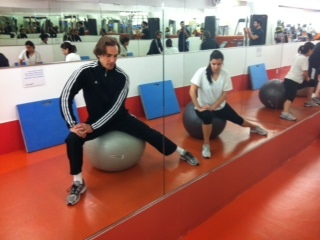 Pictured: Jordan and Christen stretch using the fitness ball, activating core muscles while stretching the legs. The Y: How about nutrition and food? Is that something you talk about? Is there more of a craving for certain kinds of foods by working out this hard? Jordan: For sure, that’s always going to be the case. The more intense your workouts, the more you’re zapping your body of glycogen stores in your organs and muscles. We have a tendency to crave carbs, which is fantastic but you want to do healthy fuel, less processed, more whole grains and foods. We talk about nutrition some and use My Fit Pal. When you live in New York and work in a tough industry, it’s tough to prepare healthy food from whole ingredients. Overall, we want to have food that is the least processed. The Y: Any thoughts from you about what it’s like in general to work with one person and see the change? Jordan: Generally, in life and in training, What you get in is what you get out. Hands down, no matter what you do. Trainers are a medium, and a trainer can only encourage you and provide you with the information and motivation needed to guide you through. Sometimes a trainer’s work can be frustrating because the client isn’t putting in the work, and not getting the results that they want. But when they Do put in that work, and they do get the results, I’m ecstatic the rest of the day. It’s only frustrating when I want it more for the person than they do. When I see someone who’s gung ho and dedicated, it makes me smile and excited in general. That’s huge for me. Being able to help people move better–When it boils down, that is why I do this. I want help people move better. The more they can do that, the more they can move through life’s challenges. For more information about Personal Training at the Y, contact Adja_Diara@14StreetY.org. Information is also available on our website. As you probably know, the Y has made a lot of changes in the last few years to increase our awareness of our carbon footprint and become a more sustainable place. To name a few, our catalogs are printed on 100% recycled FSC certified paper with soy based inks, we put renewed energy into our recycling program to make sure you can recycle cans, bottles, paper and food in our building, we have a CSA that anyone can join, and our Afterschool program began composting their snack cups and leftovers. Summer is one of our favorite times because it’s the growing season! If you haven’t joined a CSA like ours, (mountain view farms provide shareholders with fresh veggies right from the fields every week), be sure and take advantage of the rich and varied farmers markets in our city. In our neighborhood alone we have so many options! It’s a great way to not only support local farmers but to also acquaint yourself with what’s fresh right now. When you know what is available locally and seasonally you’re more likely to enjoy the freshness of what you’re eating. It also helps us understand better what it takes for non-local, non-seasonal food to get to us. For starters…lots of gasoline! Here’s a few pictures of how the Y is helping our community eat sustainably this summer. Take advantage while you can! 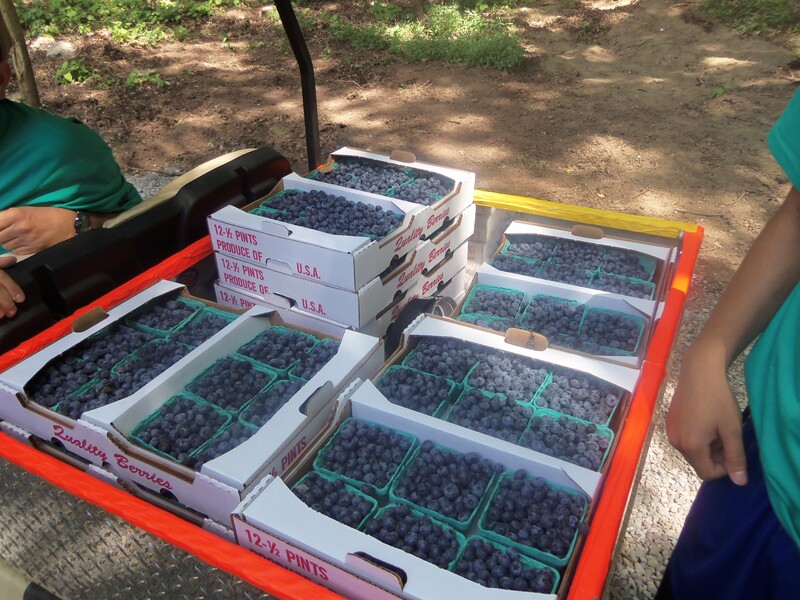 These blueberries are part of the SUSTAINABLE SNACK that our New Country Day Campers get to eat. Fresh fruit from a local farm! 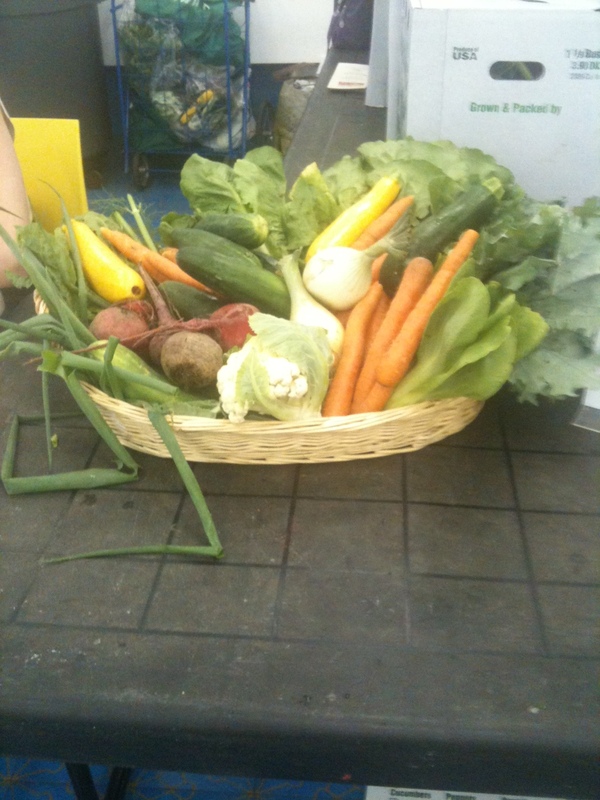 Here’s a picture of the CSA share from last week. What would you cook with these fresh vegetables? They come with recipes to show you how!